Nearly one in five people are victims of food insecurity in landlocked Niger, one of the poorest in the world. The reasons are both man-made and natural. The vast, largely agrarian country experiences a rainy season for only two months each year — and, with climate change causing havoc in weather patterns, even that is no longer a guarantee. Irregular and sporadic rainfall has led to four severe food crises in the last two decades. Now the food crises have taken an even more menacing form, aggravated by the ongoing conflict inside the country as well as in three of its neighbors — Nigeria, Chad and Mali. What follows is a series of images of meals made by families in camps and settlements, including some descriptions of how the ingredients were obtained, and at what cost. Meals include frittered bean cakes, simple flour dumplings/pasta, mixed noodles with sauce, and rice and chili soup. The article offers little editorializing, which I think is part of its power. It uses images to capture meals that are sustaining people at a moment of grave suffering and uncertainty. The topic is food insecurity in crisis, but the images are so intimate and humanizing; the little details of the meals speak to our impulse to cook and feed each other, no matter the circumstances. To say any more would be to distract from Andrew Esiebo’s photography. But I hope you’ll check the article, which is one of my reading picks this week, out. It gave me a lot to think about and feel grateful for yesterday. In a spirit of gratitude for sustenance, some recipes and reads for the week. 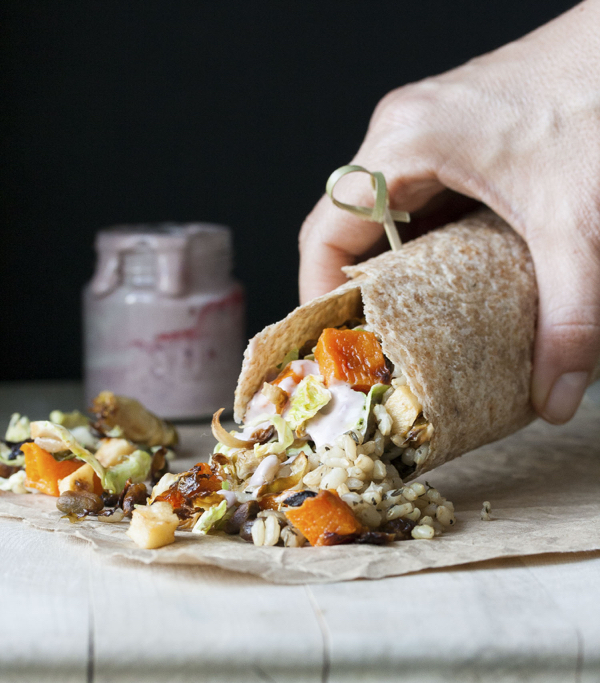 I think I’ve met my new favorite fall lunch: an autumnal burrito with roasted veggies, thyme rice, and homemade cashew mayo. 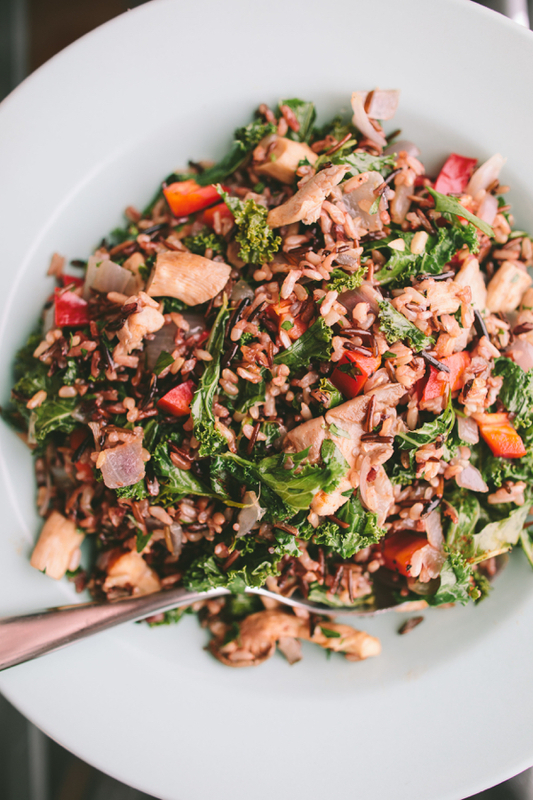 Healthful dinner in a pinch: a simple kale, oyster mushroom, and wild rice sauté from Brian of A Thought for Food. 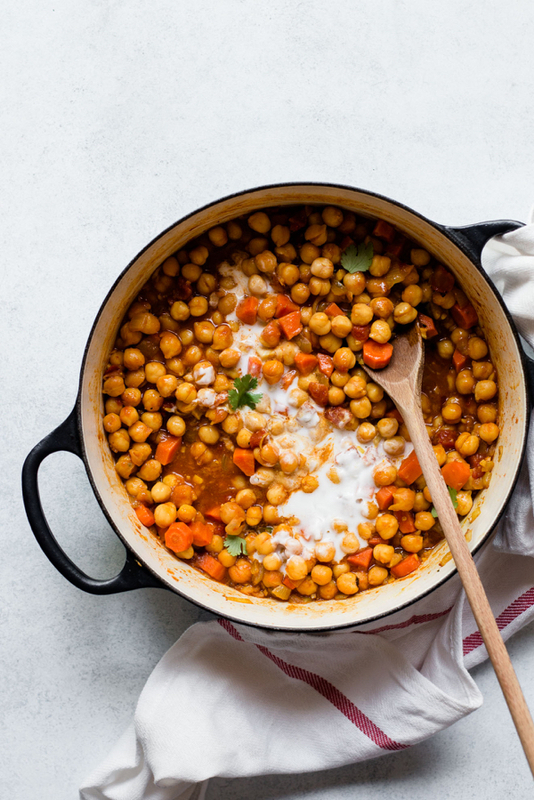 Speaking of easy dinners, I’m just loving Lisa’s pot of curried chickpeas with mint and cilantro chutney! Tons of sweet tart flavor, and it’s a nourishing, fast meal. 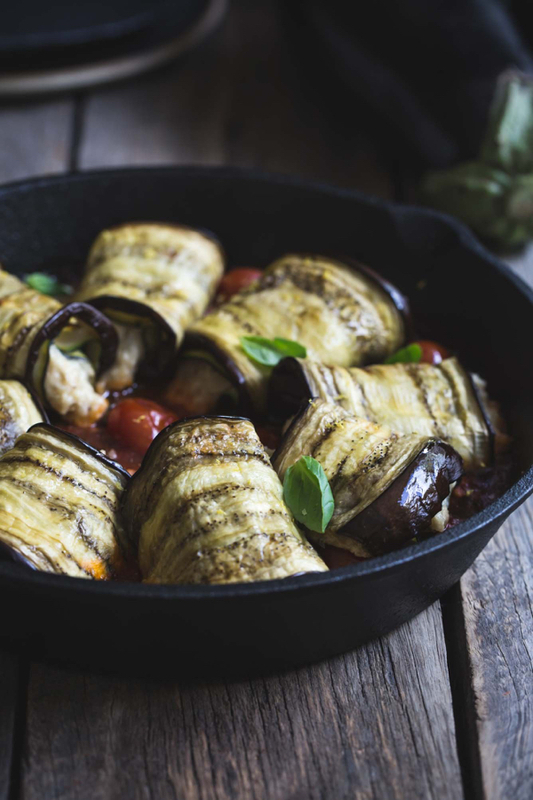 A bit of comfort food heaven: Amanda’s vegan eggplant involtini with sweet onion ricotta. The next time I need to seriously impress someone, I’m making this dish. There are still tomatoes in the markets near me (! ), and I plan to take advantage until the very last one is gone. 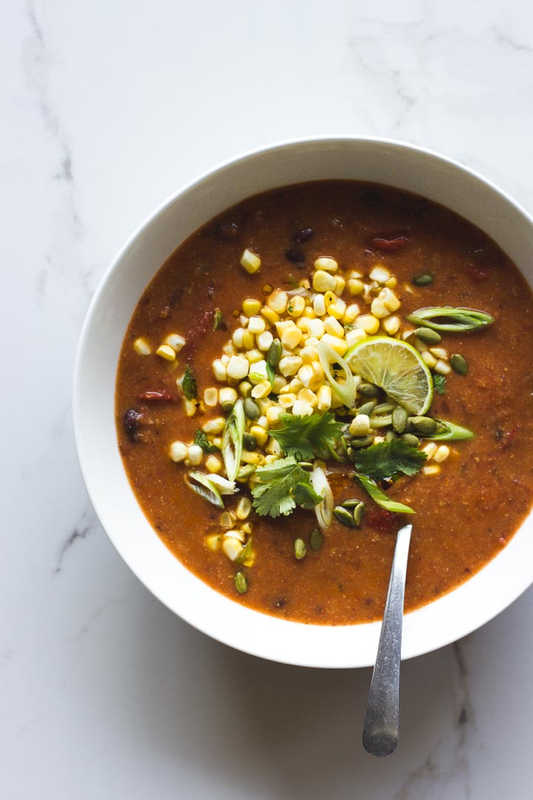 I think my parting recipe of the season will be Jodi’s wonderfully smoky roasted tomato, black bean, and polenta soup. 1. First, Buzzfeed reports on meals in a time of struggle and scarcity. 2. Neuroscientist Gregory Berns has started performing MRIs on dogs—with as little stress or compulsion as is possible—in order to better understand how they think and feel. I had mixed feelings about the article (and hesitated to share it) because it seemed to me that there’s no way to ensure that the animals are willing participants in the study. Still, the findings are pretty remarkable, and they might do a great deal to help human beings better understand and respect animal sentience. They might also be used to help traumatized animals in shelters, which would be a really important step forward in learning to reach that population. 3. More exploration of why and how nature heals. 4. Last week, in writing about my sourdough adventures, I forgot to mention a crucial detail: my starter’s name! I learned that bread makers often name their starters; it makes the process feel a lot more intimate. Emilie’s is Dylan, and it’s the offspring of a starter named Priscilla. Mine is Gwen (short for Gwendolyn). My distraction with starters makes this article, about the human impulse to anthropomorphize things, all the more fun to read—though of course it’s worth countering that starters are already very much alive, whether we name them or not! 5. I don’t usually find myself relating to roundups of wisdom by the decade, but a lot of the points made in this article did speak to me. That’s it for this morning. Tomorrow morning, I’m circling back with my Thanksgiving dessert recipe for 2017. It’s sweet, wholesome, and ridiculously easy, and I hope you’ll check it out. Dear Gena, as always I enjoyed your Sunday’s reflections. I am currently living in Burundi, poorest country on earth, and although meteorological conditions are more favorable here (very fertile region so very rich in fruit and vegetables), political and economic situation is harsh, so I can relate very much to the feelings om gratefulness, humbleness and sometimes guilt, being confronted with so much poverty, suffering and courage… my sensibility to world suffering has been one of the strongest origins of my disordered eating for years, but is very much what also defines my path, professionally and in personal life. Thank you for the reminder! PS: I hope you invite someone soon to impress with the eggplant rolls! What a beautiful blog post. Thank you for sharing so many beautiful images and explanations.